Anwar Bashir runs a company which makes learning tools for schools, colleges etc. 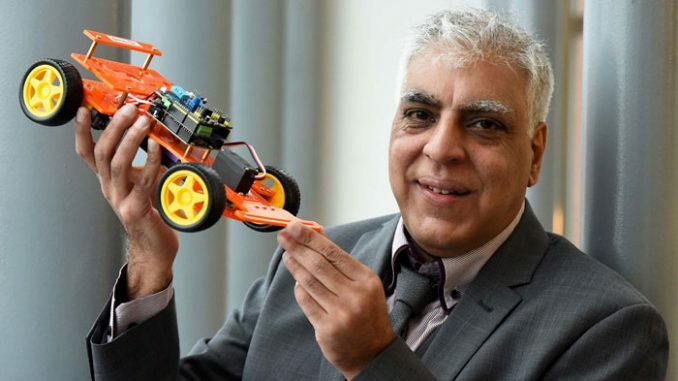 he’s developed a ‘Smart car’ – a remote controlled car which runs off wifi, to teach kids how the internet of things works. DAE and Innovate Tees Valley have given him assistance to research and market the car. Dr Bashir’s company Hypersmart is distributing the car through an e-learning website called topAcademy.com. This site will guide users through the entire process of purchasing and building the car and then go on to provide a range of courses to support further learning. Dr Bashir added: “Because I’ve been working on my own, they’ve been very helpful as a sounding board. Suhail Aslam, Innovate Tees Valley project manager, said: “Dr Bashir’s SmartCar is an extremely innovative concept and offers an engaging and accessible way for people to learn more about the Internet of Things and next-generation technology.